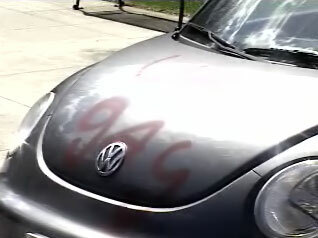 Erin Davies, a student at Sage College in New York, was targeted by anti-gay vandals when her VW Beetle was sprayed with the words “U R gay” and fag” in mid-April, most likely because the vehicle has a rainbow sticker affixed to its bumper. The incident occurred on the national “Day of Silence” in which students across the country use silence as a means to bringing awareness to intolerance and homophobia. Instead of having the car cleaned up, Davies says she plans to use it to spread a message of tolerance and take it on a cross-country trip this summer with the hateful messages still emblazoned across its windows. Davies has started a website called FagBug to chronicle her activism. She says she plans to have people attach “FagBug” stickers to her VW as she travels across country.